Summer is here and the White sharks have been in excellent form by the beach. We are getting many juvenile Great Whites with a mix of large sharks over 4.5 meters in length. The water visibility is low at the moment with an average of 2-3 meters visibility, as we have to work close to the beach and not at the Island. We have had some unusually warm water in the last week with one or two of the crew toying with the idea of looking for shark activity at Shark Alley and Dyer Island. We typically experience warmer water in our winter months due to the wind and currents caused by the onshore winds; therefore the sharks normally travel to the Island to hunt the seals there. The sharks have been in such good form by the beach; however, no one decided to take the risk to find sharks at the Island. While it would be fantastic to find sharks by the Island in good visibility, it would be a disaster to take a boat full of people there and not see anything. The Whales are still around with three mother and calf pairings left. One of the calfs is an albino and is totally white which is considered rare – only 4% of Southern Right Whales are born as Albinos. As this calf gets older the white will slowly turn to grey and then eventually black when fully mature. One of our clients who stayed over had an amazing walk along the coastline after his shark dive and spotted four Whales and one Great White Shark which was patroling along the edge of the kelp close to a small seal colony. He was ecstatic as seeing a Great White shark from the cliff edge is very rare! He was so sad to leave the Roundhouse and De Kelders, but promised he will be back next year with his family. Like most of the people who wisely decide to stay over on our Dive and Stay package, Shark Alley Express package or Big 2 Combo package they leave reluctantly promising to come back! The 7 Gill Cow Sharks are back in the bay by Millers Point and the water has been fairly warm in the bay, making diving conditions excellent! The first Blue & Mako shark diving tours went out and on both tours divers saw 20+ Blue Sharks as well as many Yellow Fin Tuna. The Mako sharks have not made an appearance on the dives yet, but it is early days and the season is just getting underway. This week we had a very large blue shark measuring in at 3 meters long. 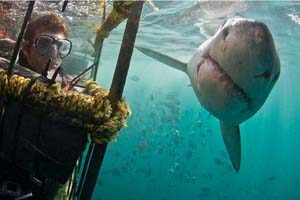 With the average size of the sharks being from 1-2 meters, a 3 meter beauty is very a special sight to see. The seal diving season has also kicked off and divers and non-divers are all coming away with huge smiles on their faces after spending an hour interacting and playing with the Cape Fur Seals. The Island is extremely busy now with pregnant females returning to give birth, huge males weighing in at 300kg+ battling for space and seal pups frolicking in the waters around Duiker Island. This is an excellent time to come to snorkel with the seals with all that activity happening. You will have literally hundreds of seals in the water to play with and photograph! The sharks have been cooking in Mossel Bay with 10-12 Great White shark sightings per trip. The visibility has also been a great 5-10 meters daily and the water is hovering around 18c. Summer is great here at the moment, but we have a week of strong Southeast winds blowing which will put things on hold until the end of the week. All in all this is an excellent place to go out to see the Great White sharks at the moment if you happen to be travelling up the Garden Route. We have had a good run of weather with clean water last week and with it some excellent diving! We have had patches of dirty water but managed to find clean dive sites to enjoy the shark activity. There are still many Ragged Tooth Sharks around (Sand Tiger sharks) in Cathedral and Raggies cave. On the baited dives we are seeing many Black Tip sharks and Dusky sharks but no Tiger sharks yet. On one reef dive the group ascended up from the bottom due to reduced visibility and then broke through the dirty layer to reveal 20 meters visibility and a huge school of Hammerhead sharks. They managed to get close to the school and take some great photos of this spectacular site. The Mozambique & Shark Week Durban packages are in full swing now with weekly visits to the most southern tip of Mozambique for some excellent diving on Pinnacles in Ponta Do Oura.